Famous for making barriers, Rotherham-based ZND UK is now breaking barriers, after a bespoke pedestrian barrier machine installed in 2012 reached the milestone of producing over one million barriers. The market leader in the manufacture and supply of high quality temporary fencing, ZND has invested millions in the manufacturing process that makes its products the most technically advanced temporary fencing and pedestrian panel range available today. Securing financial backing from Barclays enabled ZND to purchase its 170,000 sq ft Rotherham facility at Barbot Hall that manufactures more than 17,500 meters of temporary fencing per day. The firm has a turnover of £37m and employs around 100 staff. 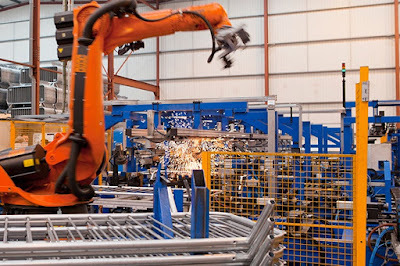 In January 2013 ZND added new automated welding robots to the production line to produce even stronger and durable barriers. A spokesperson for ZND, said: "This year, due to the success of our existing barrier production line we are adding a second updated system to run alongside our existing machine. This will allow us to increase our capacity to produce even more quality barriers for our customers." Lorries packed high with fencing are common sight on Rotherham's roads and recent high profile contracts for ZND include new cycle barriers used at the Commonwealth Games in Glasgow 2014, barriers used at events in London for the 2012 Olympics and the Queen's Diamond Jubilee, and the 2014 Boston Marathon. Over 15,000 fences and over 3,000 pedestrian barriers went to Glastonbury last year and ZND safety barriers were also in use for the Grand Depart of the Tour de France held in Yorkshire in 2014.